This is a rectangular Ehrlich-Freezer porcelain sign. This particular Ehrlich-Freezer sign is black and white. 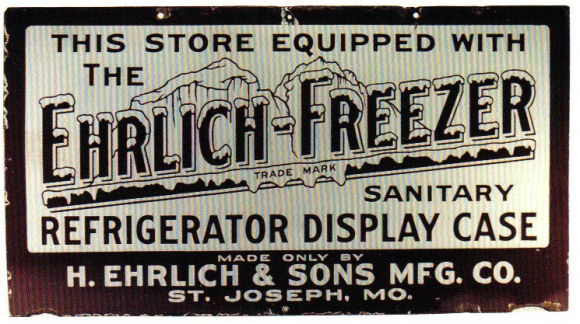 It reads, “This Store Equipped With The Ehrlich-Freezer Trade Mark, Sanitary Refrigerator Display Case, Made Only By H. Ehrlich & Sons Mfg. Co., St. Joseph, MO.” and features an iceberg in the center.